This pen is handmade with resin tinted and textured with malted barley from a Tennessee distillery. 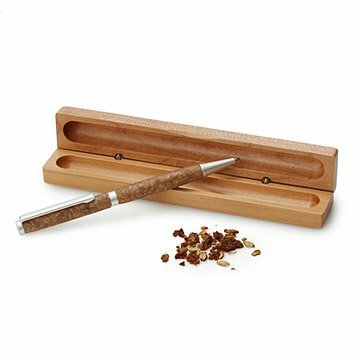 Pour over the details and distill some creative spirit into all your writing with this intoxicatingly clever pen perfect for the whiskey connoisseur. Drawing inspiration from the popular dram, Merrie Buchsbaum's caramel-hued pen is handmade with resin tinted and textured with hand-ground malted barley from a Tennessee distillery. Infused with actual ingredients from the Bourbon belt, each one-of-a-kind pen is housed in a handsome maple wood gift box. Handmade in Connecticut. Beautiful package and feel to the pen. It is a nice weight. Great gift for a professional. Boyfriend loves it! The case it came in is nice, too. He uses it for work. You can use Cross pen refills. such a unique and wonderful gift idea, love it. Its great because its so unique and Ive never seen anything like it before in South Africa. I purchased this for my husband as part of his gift for our 5 year anniversary (you know...the wooden anniversary...). He loves it and says he gets compliments and comments on it every day at work. He said he loves having a nice pen to keep with him now. I highly recommend it, and he does, too! I purchased this pen for a colleague who shares my affinity for whiskey. He was moving on to new role and thought what better gift than a snazzy new pen to whip out to sign that new contract. The case that the pen comes in is beautiful. The pen itself was lightweight and easy to handle. It looks and feels amazing---the craftmanship is top notch. I will very likely buy another one for myself. Got this as a gift for my husband. Great conversation starter and it works great.